Carefully peel just the zest off of the lemons; try not to get any white pith. 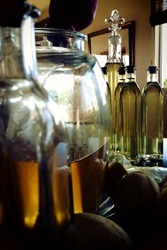 �Place lemon zest into a large glass container. Pour vodka (*or alcohol) over lemon zest; cover and allow to rest at room temperature anywhere from 4 days to a month (I leave mine ~3 weeks). No stirring is necessary, but I stir gently or swish container every few days or so. After steeping lemon zest for the desired amount of time you are going to add the water and sugar in a large saucepan and stir over medium low heat until all sugar has dissolved and it becomes clear about 5 – 7 minutes. 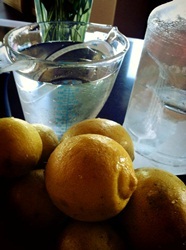 Allow to cool completely; pour over lemon mixture and allow to rest anywhere from 1 day to a week (I leave mine ~4 days). Strain liquid through a fine mesh sieve. Discard lemon zest. Bottle and store in refrigerator. It is best served very chilled. * You may use either vodka or grain alcohol, but grain gives you more of an astringent 'alcohol-y' taste, where our family likes more of a strong lemon taste.